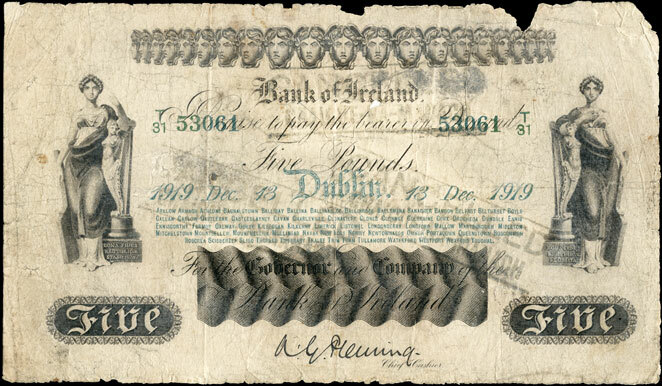 The newly updated section on 1918-1921 Bank of Ireland banknotes is now up on the main web site. Enhancements include the addition on images of all known banknote types of Series F Bank of Ireland 1918-1920 General Issue with branch listings, and Series G Bank of Ireland banknotes 1920-1921, General Issue with branches removed from the design. The most newly discovered banknote Type among these is the 1919 Fleming signature Five Pound note. Large size General Issue with branch listings. Bank of Ireland Five Pound note 1919 large size General Issue note. 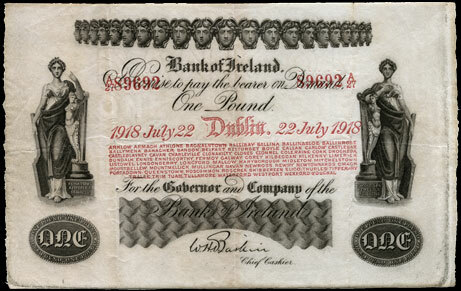 Bank of Ireland Ten Pounds 1920 General Issue, with branches removed from design. Also added is a section on reduced size Bank of Ireland One Pound notes 1918–1921 which spans both series, illustrating images of all known dates. A good few of these dates have been contributed by board members, and others have been scavenged from the net. Hopefully it will be possible to collect them all in due course. Bank of Ireland One Pound 1918 reduced size General Issue note. There may be other Types and varieties still to be discovered, as there remain gaps in the date and prefix runs for these notes. A progressive upgrade of the entire Bank of Ireland banknotes section is underway, with more new content to follow. Mac wrote: A progressive upgrade of the entire Bank of Ireland banknotes section is underway, with more new content to follow. what will be the new content? 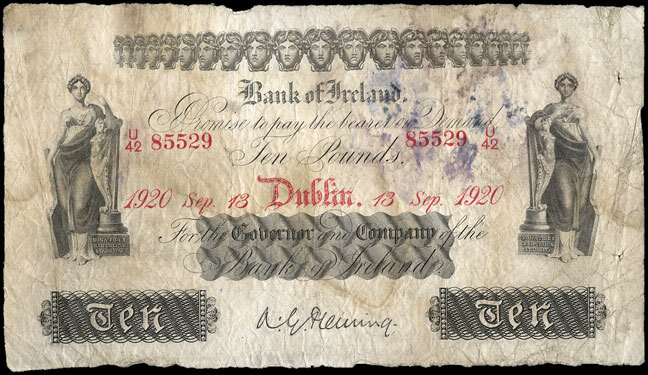 New Bank of Ireland content will be a full date listing of 1922-1928 notes, and of 1929-1958 Northern Ireland issues. After that, the older notes will be upgraded.